Ace High Storage in Dawson Creek BC is proud to offer the most reliable and secure local storage options available. Many storage needs can be met by the very versatile c can containers that Ace High builds and maintains on site. In partnership with Shell Canada and other local businesses, Ace High is now proud to offer full c can conversions for your custom needs. Offices, on-site storage or even housing can be provided with the versatile c can being used as the base. 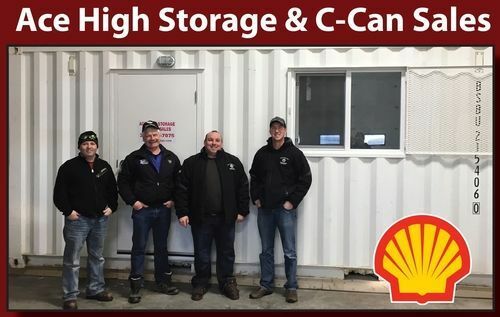 Ace High Storage wishes to thank Dan Arcand and staff from Shell Canada for giving back to local businesses. This conversion project has supported not only Ace High Storage, but also Marion Construction,Profast Towing and SCS Services. In addition to Shell's support, all the materials needed for this project were purchased from local businesses. Thanks Shell Canada for helping to keep dollars in our Dawson Creek community!